It all started 21 years ago when I had cancer for the second time. This time, I did it right and beat breast cancer thanks to the brilliant, unconventional Dr. Hulda Clark, without surgery, radiation, or deadly poisons being pumped into my bloodstream. You can read about my cancer recovery by clicking “My Story: Cancer-free!” in the menu above. Since 1994 many things have changed, and we now have new and even better tools to fight the diseases Dr. Clark wrote about. Now, unlike most people, I don’t fear “the C word” any more because I’ve been through it twice and I finally learned the “secret”. Feedback from thousands of our customers shows that other diseases can be beaten too. (read some of our testimonials here) Today, I use my AutoZap 5 Hulda Clark Zapper every day to remain healthy and cancer free. 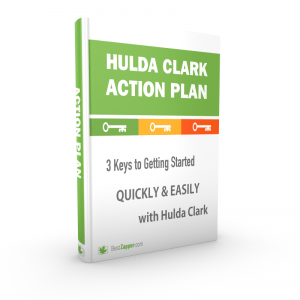 Along with organic, healthy whole foods and exercise (and some other “secrets” I share in the free Hulda Clark Action Plan ebook), these zapper and zappicator tools are the core of my healthy, active lifestyle. So what is the Zapper? The AutoZap 5 Hulda Clark zapper is a safe, effective tool to wake up your amazing immune system. This super-fast zapper is guaranteed to help you, or your money back. You cannot feel its gentle output pulses, but your body knows exactly what to do. We offer improved zapper plans for free, but it’s still a lot of work to assemble your own zapper, and home-built zappers lack most of the features that make the AutoZap 5 so powerful. Why Should I Use the AutoZap 5 Zapper? The zapper is not only for sick people or those who already have such a heavy burden of parasites that they are visibly, obviously sick. As Dr. Clark observed, health begins on the inside and by the time you see sickness outside, problems have been building up for some time. By the time I found out I had breast cancer, I’d already slid down the slippery slope of processed food, too little exercise, and all the other “normal” things that cause people to become sick – and I’d spent years doing it. Since recovering from cancer using Dr. Clark’s protocol (in just three months!) I’ve made serious, permanent changes to my lifestyle to ensure that I NEVER get cancer again. That includes using the Zapper every day, and the Zappicator too. These tools are included in the Best Zapper AutoZap 5 System. My own recovery was miraculous. Dr. Clark gave us hope. I read her first book, followed her instructions… and survived. It is the AutoZap 5 Integrated Wellness System, with the most advanced parasite zapping technology available. Just 5 minutes and you are done! The result of over five years of field testing, this new system transforms Hulda Clark zapping. never missing a day of work due to sickness. Cash in your sick days! Both are powerful new technology, and offer performance you will find nowhere else. Ready to order? Click Here to visit the Zapper Store! Faster zapping than ever before – over 12 times faster! Speedier zapping is the number one request we have received over the years, and boy, do we deliver in the Auto-Zap 5. Five minutes flat, and you are DONE, with no loss of effectiveness! No rest periods, no waiting, no compromise! Amazingly, this cycle gets these results while applying a lot less power than any other zapper cycle. The output fully meets Dr. Hulda Clark’s specifications and has the 0.25 volt DC offset she required. And you NEVER need a diagnosis or programming: just press button A. Five preset cycles are standard on the Auto-Zap 5. You asked for presets for food zappicating, body zappicating, and a full hour constant ON. The Auto-Zap 5 gives you ALL of these. SuperStraps or SuperGloves guarantee solid contact with every Auto-Zap 5 zapper! The exclusive wide wristbands, or gloves knit from conductive silver-coated yarn, are custom made for us. They guarantee comfort, convenience and an excellent connection as you use the Auto-Zap 5. You can even zap while you brush your teeth! Simple operation – if you can push a button once, twice or three times, you have already mastered operating the advanced technology Auto-Zap 5! An LED lights red, green or yellow to show you exactly what it is doing. We use a microprocessor to make things easier, not harder. Extremely reliable design – we used only premium parts to give the Auto-Zap 5 a design life of 50 years. That estimate is based on 25 cycles of use per day! Many more improvements – we added constant 10-volt output (that gives 1000 five-minute cycles from just two AA batteries), and a beeper silence mode (for use at night or in hospital) and more. The longest risk-free trial period ever offered – one full YEAR (excluding SuperStraps, which are personal use items). Of course, our full five-year warranty applies to parts and labor. Our proprietary new FreeCoil SuperZappicator design gives even better results than our previous market-leading SuperZappicator. The FreeCoil system ensures more even field strength and coverage of both food and the body. We have pioneered a new way to transfer the zapper signal to the north pole magnetic field. How well does it work? In March, 2008 Dr. Clark herself used a prototype FreeCoil SuperZappicator to get rid of parasites in her left eye muscles. She told us that they had been there for 30 years, despite regular zapping. They were vanquished in just 20 minutes! She was both amazed and delighted. We think you will be, too, when you try this powerful wellness tool for yourself. The FreeCoil SuperZappicator is designed to last a lifetime. My family and I are really enjoying using our Auto Zap 5 and FreeCoil 8 SuperZappicator. You explain it very clearly and simply, and it IS so easy to use! The Auto Zap 5 is so easy to program, even my husband and 8 year old remember which buttons to push for what function! Everyone in the house gets to “Zap” and use “The Black Book” once a day! I am especially pleased with the results so far. Pardon the details, as I am a private person, but I did pass quite a large worm of some sort AND a large fluke the very day after I first used the Zappicator, just like I read in your material! MONTHS of herbal programs (Dr. Clark and others) did not produce this kind of results! I was also shocked to find (by accident) that it eradicates my menstrual cramps! I am amazed to find that wherever anyone in the family has swelling or inflammation, whether it be parasitic, viral, chronic or whatever, it is easily relieved by the Zappicator or Auto Zap 5. I was concerned about using it on my very small 3 year old, but no more! Now that I have the system in use, I see how gentle and yet deeply beneficial it is. Thank you for your guidance and for creating such a great system! With the Auto-Zap 5 Wellness System, you won’t be at the mercy of a crumbling, costly “sickness care” system that thinks drugs are the answer to health problems. Remember, when you buy from Best Zapper, you join a worldwide family of great people discovering the power of their self-healing bodies. We support you with all we have learned, and share success stories to keep you encouraged. Together, we are changing the face of health in over 70 countries, one happy family at a time.